Important alert for Bank PO Job aspirant. Tomorrow is the last day to apply for 400 PO posts in Syndicate Bank. Graduate candidates can apply online at www.syndicatebank.in. 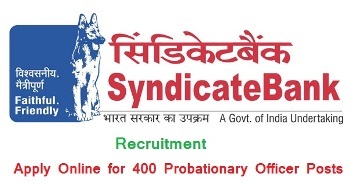 Syndicate Bank invited applications for 1 year Post Graduate Diploma in Banking and Finance (PGDBF) recruitment to the post for Probationary Officer in Junior Management Grade / Scale. The Syndicate Bank will be conducting PGDBF in partnership with Manipal Global Education Services Private Limited (MGES), Bengaluru and NITTE Education International Pvt Ltd.(NEIPL) Greater Noida/Mangalore ,to provide training in Banking and Finance to prospective candidates aspiring to join Syndicate Bank as Probationary Officer in Junior Management Grade / Scale. The candidates eligible for the post can apply in prescribed format on or before 28 December 2016. Age limit: candidate should not be less than 20 years of age and more than 28 years of age. Candidate will be selected on the basis of online examination. Shortlisted candidates will undergo 1 year Post Graduate Diploma in Banking and Finance (PGDBF) comprising of 9 months of classroom studies at Manipal Global Education Services Private Limited (MGES), Bengaluru or NITTE Education International Pvt Ltd.(NEIPL) Greater Noida/Mangalore and 3 months internship at Syndicate Bank’s branches and will be given opportunity to join Syndicate Bank as Probationary Officer in Junior Management Grade / Scale. Eligible candidates can apply online through the official recruitment Web Portal (syndicatebank.in) on or before 28 December 2016. Application Fee: Rs 600 (Rs.100 for candidates of reserved category).